Switzerland's Rahel Aschwanden has qualified for the 2016 Belgium Open Women's Singles main draw, after pulling off a dramatic comeback victory in group 11. Rahel Aschwanden and Magdalena Sikorska (Poland) began the session level on two points each following 4-0 wins over Belgium’s Marie Maesen on day one, and with the group winner guaranteed a spot in the next round, the match between Aschwanden and Sikorska carried an added sense of importance. Sikorska was the first to register a game on the scoreboard in the final group match, and despite her opponent fighting back to take the second end it was Sikorska who gained a strong lead after the opening four games. Not willing to admit defeat, Aschwanden claimed three consecutive games to complete the comeback (4-11, 12-10, 7-11, 3-11, 11-7, 11-6, 11-5) and remarkably seal a spot in the Round of 32. Switzerland will have a second representative in the main event, with Rachel Moret also progressing from the qualifying groups. Moret had beaten Italian Giorgia Piccolin on the opening day, and her victory against Nathalie Marchetti (Belgium) in the last qualifying match was enough to ensure a comfortable passage through to the next stage of the competition. 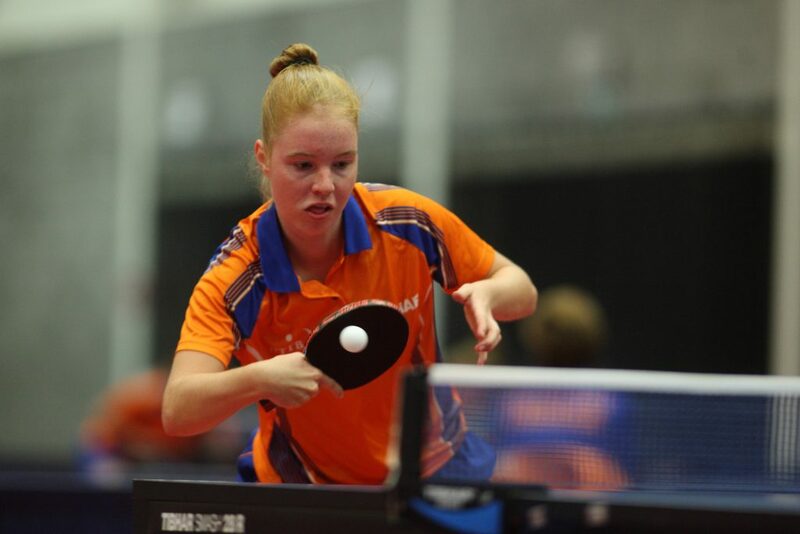 There is just the one competitor from the Netherlands remaining in the Women’s Singles, following the exit of four of the country’s players. Yana Timina had put herself in a decent position to achieve at least the runner-up spot in group 14 having picked up a 4-3 win over Mercedes Nagyvaradi (Hungary). However, debutante Yui Odono (Japan) put in another strong performance to leave the Dutch player in third place. Elimination also came for Rianne Van Duin, Tanja Helle and Shuohan Men, with the latter player suffering a cruel exit on game countback. But, Kim Vermaas has kept the Dutch flag flying in De Haan and the 20-year-old will take on Hungary’s Dora Madarasz in the main draw. Russia’s Mariia Tailakova took top spot in group 15, winning her tie with Laura Pfefer (France) in a winner-takes-all match. Both Tailakova and Pfefer went into the encounter with victories against Lindsay De Vos (Belgium) and Mallika Bhandarkar (India) from the previous day of action, but only the group topping players were assured of tournament survival. Tailakova ended the group as the happiest competitor, after she overcame Pfefer across six games. “I am very happy, it’s the first time that I reach the main draw of a World Tour event. Against Pfefer from France it was difficult, but I was able to find the good rhythm at the right moment. My goal is reached now there no pressure for the main draw anymore.” – Mariia Tailakova (Russia).